If you’re in any way infatuated with Chicago’s tight-knit musical bedrock, it’s super likely you’ve once been spellbound by the prowess of Macie Stewart and Sima Cunningham. The more visceral nature of the duo’s own project Ohmme highlights a different side than the commissioned work they’ve done with heavyweights such as Chance The Rapper and Jeff Tweedy. In their twenties, Stewart and Cunningham have pretty much seen the full spectrum of what performing and recording entails, from big arena shows to DIY house romps. They can lay claim to some pretty iconic moments in modern pop; it’s tough to imagine SZA’s ‘Drew Barrymore’ without Stewart’s shimmery string arrangements navigating it to sheer timelessness. If conventional pop music is a picture perfect postcard, consider Ohmme its quirky Dutch-angled counterpart. And delightfully so: the two classically trained multi-instrumentalists wholeheartedly welcome chaos and discord into the frame. Like a Pieter de Breughel masterpiece, debut LP Parts’ totality is sprawling and sublime; but as they say, the devil lives in the details. With Ohmme, Cunningham and Stewart cast out the ghosts of discomfiting, testy experiences that one tends to be hung up about. ’Left Handed’ recalls a moment of casual misogyny by someone who’s supposed to be trusted. The album’s the title track’s phantasmal pulse and eerie overdubs encapsulate that feverish intermediate struggle of being not quite awake and not quite asleep. Everything about Ohmme appears charmingly knee-jerk. Even in their music’s more subdued moments, its hairs stand up with acute electricity. The first show Stewart and Cunningham played was booked before they’d written even a single note together. It forced the two to hit the ground running immediately, relying more on quick-fire, read-and-react reciprocity over their well-honed classical chops. The Chicago-based duo may have used experimental guitar textures as their creative starting point, although curiously enough, Ohmme doesn’t sound remotely like a rock band. Just like films are often shot in non-chronological order, Ohmme tread those risky stray paths as they unravel, doing so with sure-footed glee, confidence and abandon. DiS: Given the sheer breadth of artists and performers you work with, does all that acquired knowledge play a big part in performing and recording with Ohmme as well? Sima Cunningham: We feel Ohmme are a very flexible band. Both Macie and I have been lucky enough to play in any kind of venue imaginable: from the back of the library for three people to enormous festivals to tens of thousands of people, just depending on the gig we’re doing; whether it is our own music or performing with other people. And I think because of that, we’re pretty attuned to it; to be able to make the performance what it needs to be for that night. We don’t get thrown off if the sound is horrible. We’ve played so many gallery shows where we don’t even have any monitors. That means we have to power through and figure it out. But we also play great shows where we have four monitors each and get a full sound check. The point is to take the show for what it is and find a way to lean into it as much as possible. If it’s a performance for eight people, well, those have been some of our best shows! The early shows where we were just touring and trying out, playing random towns. If just a couple of people show up, those people end up becoming part of the performance. I think we both enjoy those moments because it feels – first of all – incredibly intimate. Macie Stewart: I think we are really adaptable with Ohmme, because we’ve been performing in all these different spaces in different contexts. There was a period when we played with the idea of someday doing a tour of just art gallery places. I would say we do think about it, but it doesn’t affect our performance necessarily, to the extent that it changes the way we do it. We like to take the space to our advantage, and use it as part of the performance. Art spaces, of course, have an important visual component. Is that something that preoccupies Ohmme too, the visual element of live performance? MS: We definitely want to get into that type of thing. It’s always difficult when you are in the beginning stages of touring. You don’t know exactly what type of venues you’re going to be performing. It’s a little hard to figure out right now, but we are definitely thinking about it. When we do our record release show we’re trying to make it something all-encompassing, on an admittedly small budget. SC: We know a lot of visual artists we love collaborating with. One of our earliest shows had our friend Liz Born created these enormous backdrops that come from the ceiling of the venue we are playing. I think it’s really fun to tie that stuff in. We have a lot of friends active within the performing arts community and theatre. We have a friend who stages these elaborate performance art pieces and videos. A part of us loves to jump on stage immediately and just play music, but there’s no shame in really putting on a show and bringing in those visual elements. Personally, I’m excited to work with more concrete ideas on how to utilize lighting. Our eyes are so directed by light sources these days, and being able to play with that whole new element to immerse people in your show. Also, there’s a lot of visual art that influences our music, and we’ve always been appreciative of friends who have been visual artists at a really high level. When we’re travelling, we always go to a lot of museums to experience visual art. It helps us disengage because when you’re on the road a lot, the only sense you can really stimulate is your ears; in the form of records, radio or podcasts. Once we get out of the van, we crave physical and visual stimuli. Speaking of museums, there’s one lyric of the title track that talks about “taxidermy humans”, which I find both witty and disturbing. SC: That lyric as was inspired a couple of years ago when Macie and I did a DIY tour across Europe. We did a sprint through the Louvre in Paris, just to try and observe as much as possible in the little time we had. It’s funny actually, just today I’ve seen this large-scale installation that felt to me like a festival for selfies. Every corner was set up in a way that was practical for people to take pictures of themselves with something. To point and gape at something, which I find a strange phenomenon. I think that might be because I grew up as the daughter of an artist, being forced to slow down and absorb art, even if I didn’t understand it. It was taught to enforce a patience onto myself. It’s hard to say what that lyric is pointing to, but I think it’s hinting at the frustration of the gaping culture – the pointing, the shock and awe. The whole song is a bit of a spoken grudge, within the surrealism of being in the Louvre and seeing all those tourists taking pictures there. I was recently at this exposition on hyperrealism, and it had all these life-like sculptures of humans. A lot of these sculptures evoked a primal or natural state of being. Seeing real people take selfies with them was such a strange sight. SC: Well, it’s a strange time right now and I’m still grappling with it. Because taking pictures of ourselves is a form of communication. Putting your face in front of people’s eyes and in front of things. I don’t have any super wise words to share about it, but I think it’s something most people grapple with at some point. How they want to interact with people – especially digitally – and how they feel about it. Is it narcissism? Is it natural that humans want to see other humans’ faces, that they gravitate towards that? 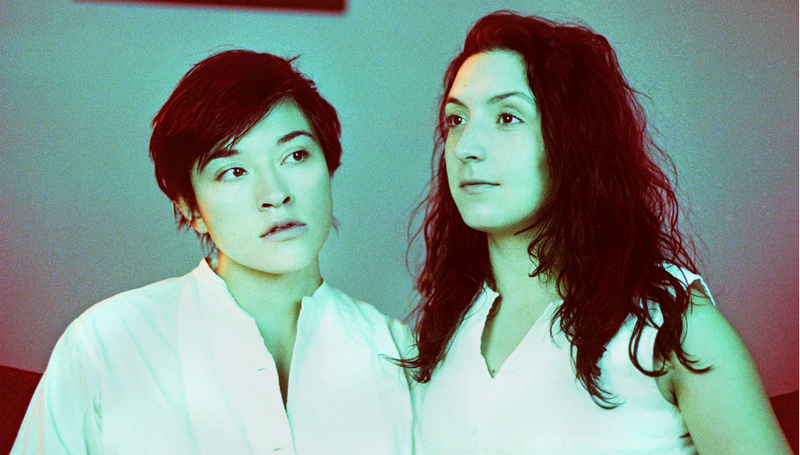 Ohmme started out with a strong limitation: compose music on guitars. How do you see the music developing from here on out? Is it about setting brand new parameters to create. Or continue with the same parameters? MS: When we started out, we wanted to limit ourselves to guitars. If we had allowed ourselves to play any instrument, it would have been a mess. There would have been way too many ideas to contend with. Sometimes you need to place parameters to break down the walls you have created for yourself in new and interesting ways. If you just leave it open, it can get a bit out of hand. So it was important to put limitations on ourselves, instead of somebody else placing them onto us. For Parts the main parameter was the amount of overdubs we did, to make sure that almost all of the basic tracking was done together in the room at the same time. That we were playing as a band. And trying to fill out all of those parts as much as we could in that one take. I think it worked out; it made us tighter as a band and as a whole. I don’t know yet what we’ll do for the next record. That’s probably something we’ll figure out as we are touring this record, living through this album cycle. SC: On our first EP we played the drums ourselves, and for this one we have Matt Carroll join us. It was a really cool thing, because Matt allowed us to be more flexible, to bend into new territories. Even when we were avoiding any central rhythm, one of us would have to keep track. That can make things a lot looser, which is really fun. But to answer the question, I honestly don’t know where Ohmme will go next. I don’t think we have any preconceived ideas, major guitar technique down in our hands. The sound of Ohmme is still very much grounded into how we play our guitars. I’m happy if this continues, because I think we don’t sound like any type of guitar player. It’s exciting to delve even deeper into that. Both of you are very proficient multi-instrumentalists, whereas the guitar was an instrument you wanted to tackle viscerally. But does this free-form mentality carry over the instruments you’ve both learned to hone from a technical standpoint? MS: Yeah, but maybe more in a more abstract subconscious way. We both grew up with classical music, and I almost went to college for classical piano performance and also played classical violin. So for a solid five years, I was practicing five hours a day. The reason we wanted to learn and approach the guitar this way was to release all the Western-classical ideologies from our brains, or at least tell us that we don’t have to play an instrument any particular way. Lyrically, both of you have dabbled in more traditional songwriting. But once you start improvising musically, it’s interesting to break down how that affects your lyrical tendencies. Does a more stream-of-consciousness approach to lyrics reveal unexpected personal truths? MS: Absolutely. But I used to write songs with the same mentality as I write and play music. It was a little more straightforward, in-the-box. I always liked to experiment and push boundaries, but I didn’t know what existed outside of that. So in the past five, six years my lyrics and the inspiration behind them have become much more visceral. A lot of the lyrics are my own introverted thoughts spilled over onto paper. Only after the fact am I able to analyze them, rather than the moment I’m writing them. It must be very liberating, because that way, the lyrics won’t be immediately tied to the person singing them. You can be honest without giving the impression of narrating your life to the minutiae. Does it inspire you to become even bolder in that respect? SC: I’m always happy to let people absorb for themselves what the songs mean. Some of the lyrics I wrote for this record have been therapeutic moments over the past year. It hard these days to not be deeply frustrated. These lyrics are the neurotic, frustrating moments in my mind. It jumps around a lot. But in giving voice to those thoughts, I also want to leave some space for the listener. It all comes from a very internal place from both Macie and myself. I hope people can find their own connection within what we are expressing. Sima, in your TED Talk Do You Speak Music? you said something about music being like fire, something you can give to people without losing it. I thought that was very on point. SC: I’ve been lucky to interact with people all over the world in my life, and I never fail to be amazed by music’s ability to jump over any barrier you might have had between someone or something. Language barriers, political barriers…it’s always been that way, and I think another barrier to overcome is the feeling that people can hide themselves in these digital presentations. Both of us are big believers in the power of live music; people getting out to shows and being present for their community. We’re excited that our music gets to be part of that. Parts is out now via Joyful Noise. For more information about Ohmme, please visit their official website.